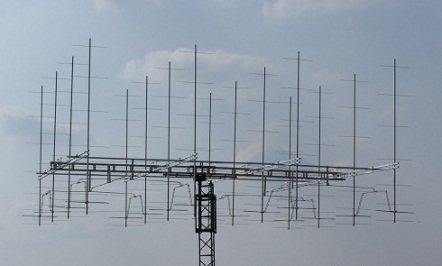 Antennas: EME can be done with a single yagi antenna, for example, with 15dBd of gain and 100 watts, however, it is much better to have something like a set of 4 yagis. This is because it will be much easier to hear and work more stations. Typically an overall antenna gain of 18 dBd is a good starting point. The more the antenna gain is increased, the better the operator will succeed at working more stations. Antenna Polarization: The typical polarization used by most EME Operators is horizontal polarization, however, it has been shown that having switchable polarization from horizontal to vertical or Polarity Diverse Switching can be of great advantage when operating EME. As the radio waves travel to the Moon and are reflected back to Earth, they have a tendency to change polarization. This phenomena is referred to as “Faraday Rotation”. The polarization is never really known exactly when it is received and it can not be particularly predicted. It has been proven by many EME Operators recently that having the ability to switch the polarization for the best signals yield the best results for an EME contact. Some EME operators are now resorting to the switchable polarization or Polarity Diverse Switching antenna systems. With Polarity Diverse Switching, it is possible to receive signals at any given angle in 45 degree increments giving the EME operator the very optimum in EME signal strength on receive and transmit. The Polarity Diverse Switching Antennas usually consist of several cross-polarized yagis and a special phasing harness with several switching schemes that are constructed using several remote controlled coaxial switches.The operator can select any polarization in 45 degree increments for the best signals using this type of antenna. Receiver Noise Figure / Receiver Sensitivity: Always keep the Receiver Noise Figure as LOW as possible (at least lower than the sky noise for the band that will be used). Noise Figure is expressed in “Degrees Kelvin” or in “dB’s”. Sky Noise is noise generated by the Sun and other celestial objects in the sky and space. Even the ground generates some noise, which is sometimes used as a reference to determine Antenna Noise Temperature. The higher the frequency band is, the lower the Sky Noise is for that band. Lower Noise Figures will be more important at the higher frequencies. Another way of looking at noise figure, in a simple way, is the ability for the receiver to dig out weak signals in the noise. Typically, the noise figure should be 1dB or lower on most bands. Some Gaasfets on the market can go as low as 0.1dB’s. EME Frequencies: Some operators claim that 144.020 is the EME calling frequency on 2-meter but generally, random signals appear all across 144.010 – 144.050. Plenty of the time, EME contacts are scheduled ahead of time and the exact frequency is known. The EME frequency segments are 50.000 – 50.050 on 6-meter, 144.000 – 144.050 on 2-meter, 222.000 – 222.025 on 222MHz, 432.000 – 432.070 on 70-cm and 1296.000 – 1296.050 on the 23-cm band. EME can also be found on all other bands above 1296MHz.